Getting There From Here: the two-career approach, additional education, self-employment, pitfalls of career change. This small book covers a lot of ground! I read some parts thoroughly and skimmed others that were less relevant to me. It was broken up into many short chapters and included some questions to ponder with a suggestion to write your answers in a career journal. 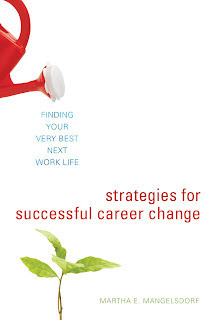 It covers all stages of career transition, and I appreciated that it lacks the spiritual new-age vibe that some of these books have. The author acknowledged that you may be changing careers when you don’t want to (for financial reasons, lack of jobs in your field, etc). No illusions like “do what you love and the money will come.” She talks about those kind of books and says it’s ridiculous to think that just because you love doing something, it will make you rich. Thank you! If that were the case, I could get rich by reading books and knitting sweaters while drinking wine on my couch, which clearly has not happened. She talks about “blended careers” – doing two different things part-time, either while making a career transition, or permanently – which I found very intriguing, and which she made sound quite feasible. Many (but not an overwhelming number of) helpful references to other books and resources. As long as there are still appealing library jobs being advertised and I continue to get interviews I won’t change careers, but it is comforting to know that I could if I want to. Even after reading this I don’t know what other career I would pursue, but I still found the questions very helpful in thinking about what direction to take, and also just ensuring that I’m in the right career now. But if you’re thinking of making a change, this book can help!